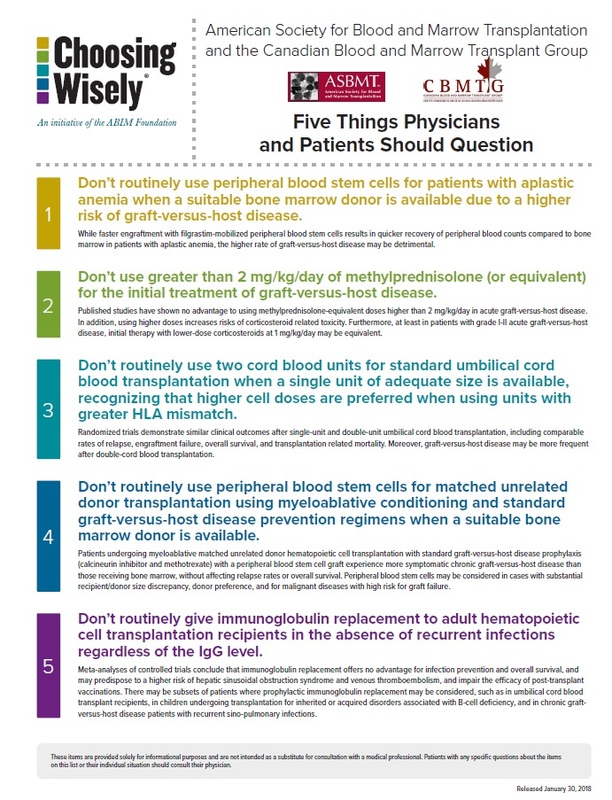 ASBMT and the Canadian Blood and Marrow Transplant Group (CBMTG) have partnered with Choosing Wisely and Choosing Wisely Canada to develop the first Choosing Wisely BMT list of five transplantation practices that clinicians should consider. Suggestions for the list were solicited from ASBMT’s Quality Outcomes, Practice Guidelines and Education Committees, CBMTG Program Directors, and Chairs of Center for International Blood and Marrow Transplant Research Scientific Working Committees. The 119 unique suggestions received were ranked, and the final short listed recommendations were subjected to systematic reviews to establish the final five. The list, with the rationale and key references for each recommendation, is available here. A manuscript detailing the methodology and summary of evidence for each recommendation is online now at ASBMT’s journal – Biology for Blood and Marrow Transplantation. Other members of the Choosing Wisely BMT Task Force included: Jeffrey Betcher, Christopher Bredeson, Luciano Costa, Andrew Daly, Christopher Dandoy, Zachariah De Filipp, Vi Doan, Alison Gubis, Lisa Hicks, Mark Juckett, Nandita Khera, Amrita Krishnan, Navneet Majhail, George Selby, Nirav Shah, Melisa Stricherz, and Auro Viswabandya. The American Society for Blood and Marrow Transplantation (ASBMT) is an international professional membership association of physicians, investigators and other healthcare professionals involved in blood and marrow transplantation and novel cellular therapies. The ASBMT represents the interests of transplant clinicians and investigators and the patients they serve in eight broad areas: research, representation, clinical standards, regulation, communications, accreditation, reimbursement, and recruiting and training clinical personnel.